Explore the South Rim while taking in sunset views in our open-air Pink® Jeep®. Your first stop at Yavapai Point is the perfect introduction to the Grand Canyon. Here, the eons of erosion reveal layer upon layer of sediment. Your certified tour guide (who is also a Wilderness First Responder) will share the history of the canyon. At Grand Canyon Village, step back in time at a historic district that was once a stop for stagecoaches. The village is home to El Tovar and Hopi House, both of which opened in 1905. As you walk around this bustling hub, it’s easy to get a sense that you’re sharing the street with pioneers centuries ago. 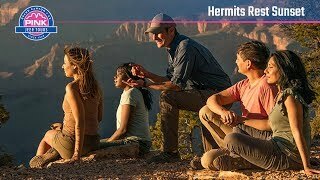 Enjoy a short, scenic ride to Hermits Rest. This area and its buildings pay tribute to a prospector who carved a trail into the canyon and later lived near Dripping Springs. Hop out of the Jeep and explore the wonders below on a short hike via a rocky path below the rim. Along the way, your guide will show you how to find real marine fossils and teach you about the canyon’s ancient origins. You’ll also view the Hermit Rapids and other landmarks, such as the long-abandoned Hermit Camp. The hike is 1 mile roundtrip. After you’ve enjoyed a hands-on experience with the area’s landmarks and buildings, you’ll be able to explore further with Grand Canyon: The Hidden Secrets. This IMAX classic presents history lessons about the explorers of yesteryear and shares wild canyon locations where few people have tread. This tour includes a hike on a rocky path below the rim, 1 mile roundtrip. Our guide definitely added to the experience. Loved seeing a part of the canyon I hadn't seen before! Loved hiking into it as well! Lucy was wonderful! Very engaging and knowledgeable. We had a great time and the guide was very nice and informative. It was great getting away from the crowds and getting to experience the Grand Canyon like that. My sons and I had a great experience. I am very grateful that I booked this tour. Thank you! We learned so much more than any video! We were basically the only ones on the tour so it was nice to have a personal guide with us. He was mindful of our physical abilities so took the time to hike up and down the canyon. He interacted well with the kids in showing them various fossils and teaching them about the vegetation on the canyon. My son really enjoys these and was with him at all times asking various questions. We all learned a lot from this tour about the canyon and its history. Wonderful tour. Being able to hike below the rim is an awsome experience; hope to hike below the rim again one day. Would like ro explore deeper into the canyon.